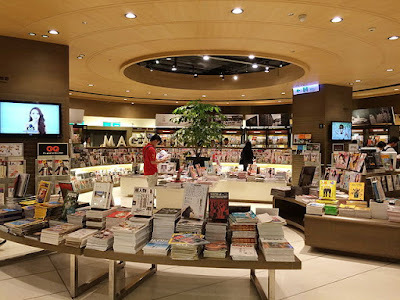 Goodbye To Taipei's Legendary Dunnan Eslite Bookstore? Sad news for all of Taipei's book lovers: the legendary Dunnan Eslite Bookstore (誠品敦南店), chosen by CNN as one of "the world's coolest bookstores", might soon be gone. According to Housefun News, Dunnan Financial Building, where the bookstore occupies five floors, will be demolished and replaced by a 26-storey high skyscraper with 7 underground floors, which will house a 5-star hotel (By the way, I am wondering if there was no other location available for a new hotel; with all the ugly nondescript buildings in the neighbourhood ...). The news was also mentioned on Taiwanese websites such as Apple Daily and EToday. However, Eslite Spectrum Corporation, owner of the bookstore, denied it would shut down its Dunnan branch, but it added that the lease for the bookstore expires in 2020. It's not so clear what is going to happen, but let's hope that this historic bookstore will not be closed. The first Eslite bookstore was opened in 1989 in Ren'ai Road. In 1995 it moved to its current location in the Dunnan Financial Building. In 1999 it became Taiwan's first 24 hours bookstore, and it is now a must-see for tourists who want to explore Taipei's culture and lifestyle. 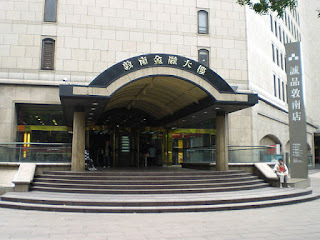 Wang Dan, one of the student leaders of the 1989 Tiananmen protests who now resides in Taiwan, described the bookstore as a "cultural landmark". He wrote on his Facebook page that if a construction company should demolish it in order to make more money, then Taipei would deserve to be called a "crappy" city. He added that a bookstore which stays open 24 hours, allowing people to go somewhere and read even when they cannot sleep, is admirable. Dunnan Eslite Bookstore is one of my favourite places in Taiwan. It was quite far away from my home, but since I love walking around for hours (as I will explain in future posts) that wasn't such a big deal. The first time I went there was in November 2011. It was my first stay in Taiwan. I had an appointment with a language exchange partner. We met at Zhongxiao Fuxing MRT station, and she took me to a traditional restaurant nearby. After dinner we walked to Dunnan Eslite Bookstore. That was my very first week in Taiwan, and I still remember vividly the excitement of walking around in the crowded streets of Taipei's most fashionable district - often just called 東區 (Eastern district) by the locals. Later on, Dunnan Eslite Bookstore became my regular meeting point with a friend of mine. She works at an office nearby, so it was easy for us to hang out there after she got off work. Well, that place is just a big part of my life in Taipei, and I hope it will just stay where it is.